The first issue of Peace Seeds appeared on January 29, 2007. This issue, number 107, will be the final issue of our newspaper. For more than five years, the junior writers of this "virtual peace garden" have reported on peace issues from a variety of viewpoints. Among our achievements, we carried out a survey of visitors to Hiroshima Peace Memorial Park every August 6, the anniversary of the atomic bombing; we helped organize the APEC Junior Conference and other events to discuss our daily efforts and thoughts concerning peace; and we published a book and produced a DVD. "Peace" is not merely the absence of war. We must also turn our attention to the problems around us, including such social issues as bullying, child abuse, hunger, and environmental destruction. By making the earth a place where the lives of all human beings are valued, we can advance toward a more peaceful world. The junior writers will now continue their efforts for peace in new ways. We hope our paths will cross again in the future. Click on the messages below to open a larger PDF file. The number that appears on each photo indicates the issue number. On this website you can read the articles that are related to the photos. These are messages from some of the people we have interviewed to date. They comprise a collection of peace messages for children and teeens. In any international activity, there are three important things to show your respect: calling other people by their names, using proper greetings, and saying "thank you." Youth today can enjoy freedom, so I hope they study hard, learn to think for themselves, and find ways to promote peace. We mustn't judge the whole of something based on only the part that's visible to us. We must imagine what may lay hidden on the sides that we cannot see. I experienced the war myself. During the air raids, bombs fell nearby. I feel strongly that such things should never happen again. Peace blossoms in war, while war grows from peace. If you can't speak up to stop bullying by yourself, you can do it with other friends by your side. It's important to bring up children who are capable of helping their friends. People can learn a lot from each other as we all have different ways of thinking and behaving and different cultures. By doing so, you can find new things about yourself. Curiosity is vital to making your dreams come true. Clarifying the cause of difficulty in your relationships and respecting your differences. Creating peace in our own lives leads to widening peace in the world. Japan should take a peaceful and diplomatic path, reaching out to all nations, instead of relying on military might. 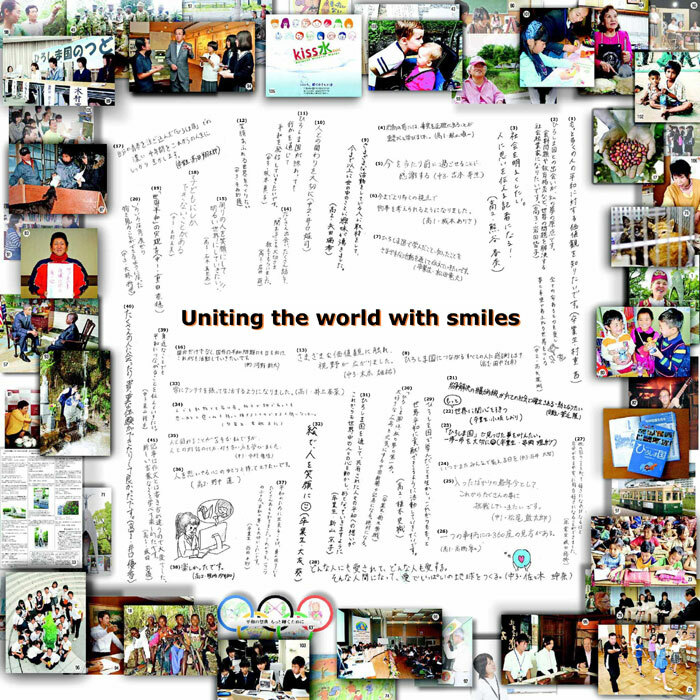 There are so many people who need your help, therefore look beyond Japan and become a global citizen. If people can come to trust each other, they won't need to keep nuclear weapons and wage war. They won't need to fight to reach victory and defeat. You dream that it is possible to have a world where war is no more, where poverty is history, where no one goes to bed hungry, where children do not die needlessly for lack of clean water, etc. Go on dreaming those dreams and pester your parents, the adults, to work together with you for such a world. People who didn't experience the atomic bombing directly shouldn't feel reluctant about speaking out. In fact, it would be impossible to hand down the experience if people don't feel free to talk about what happened in Hiroshima. It's important to experience life abroad, such as having a homestay with a family in another country. Please learn to speak English, which is vital for interacting with people abroad. That might even help you land a job in another country and marry and raise a family there. While enjoying an international lifestyle in a new marriage, it's still important, I think, to embody the proper traditional culture of Japan.